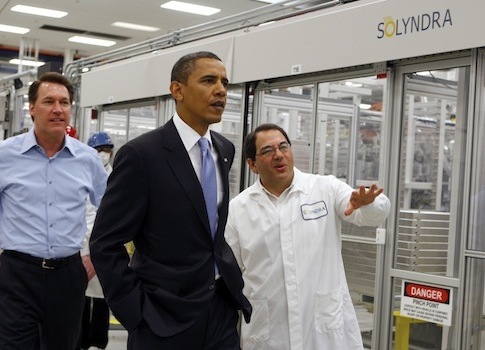 A private equity firm with close ties to the Obama administration could end up profiting from the bankruptcy of Solyndra, the solar panel company that received more than $500 million in taxpayer-backed loans. Argonaut Ventures I LLC—a private-equity fund linked to George Kaiser, a fundraiser for President Barack Obama—and Madrone Partners LP are set to pilot a reorganized shell company out of the wreckage of Solyndra, part of a Chapter 11 plan that promises scant repayment of a $528 million federal loan. The reorganized shell company could be a vehicle to transform the money Solyndra lost in the solar-panel-manufacturing business, losses that total "significantly more than one-half billion dollars," into future tax breaks for the private-equity firms, according to the DOE and IRS. The U.S. Department of Energy (DOE) and Internal Revenue Service (IRS) wrote in a bankruptcy court filing last week that "Argonaut and Madrone could potentially use Solyndra's net operating losses to avoid hundreds of millions of dollars of future income taxes." Kaiser, the Obama bundler closely linked to Argonaut Ventures, raised between $50,000 and $100,000 for the president in 2008. Private equity firms like Argonaut were given priority status over taxpayers as part of a loan restructuring agreement between Solyndra and the DOE in early 2011, months before the company filed for bankruptcy and laid off nearly 2,000 workers. Republican investigators allege this was done in violation of federal law. This entry was posted in Politics and tagged Cronyism, Department of Energy, Loan, Obama Administration, Solyndra. Bookmark the permalink.